I am a highly committed and passionate Social Media Executive with excellent IT and writing skills. I thoroughly enjoy reading and writing blogs and have been involved in creating marketing strategies. 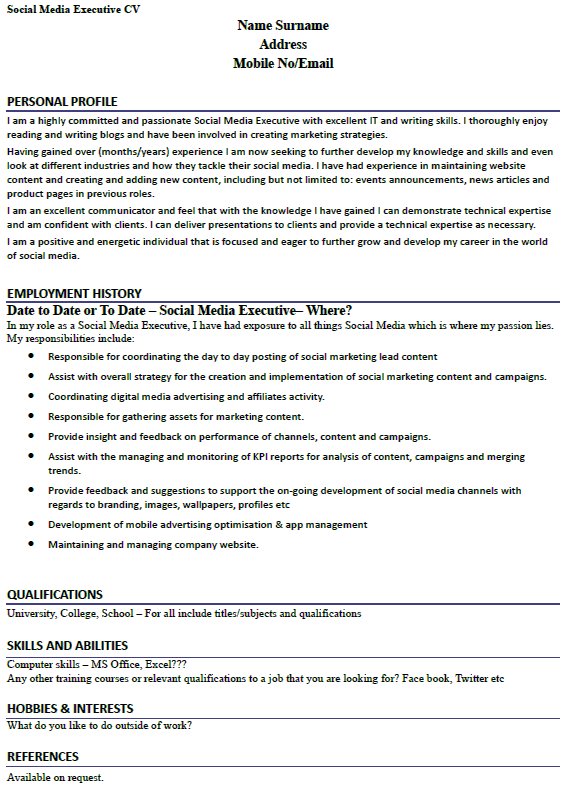 Having gained over (months/years) experience I am now seeking to further develop my knowledge and skills and even look at different industries and how they tackle their social media. I have had experience in maintaining website content and creating and adding new content, including but not limited to: events announcements, news articles and product pages in previous roles. I am an excellent communicator and feel that with the knowledge I have gained I can demonstrate technical expertise and am confident with clients. I can deliver presentations to clients and provide a technical expertise as necessary. Date to Date or To Date – Social Media Executive– Where? Assist with overall strategy for the creation and implementation of social marketing content and campaigns. Maintaining and managing company website.